Summer Street with the facade of the old Filene's building on the left, Macy's Dept. Store on the right. In the foreground left is a fruit vendor the city moved when Filenes was going to be converted to a high rise mixed use condo/retail development; since that is on hold the green grocer is back on Summer Street. 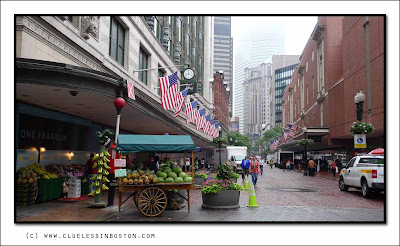 Walking a few blocks down Summer Street will bring you to South Station. A bit surprising with the fruit stand, but why not, I will have some water melon please. Thanks for filling us in on what is/was planned for the Filene's building. Great photo. Such a wonderful urban shot with the fruit and the flowers and the brick streets and the buildings vanishing into the bleached sky. So sorry to hear about its demise. Super photo, Clueless...rainy days make for good photography and this is colorful, composed very well, and tack sharp! I like the mood of this picture: it just rained, so the weather is pleasant.It's a pedestrian area.The clock tells us the time. The mix between the tall modern buildings and the fruit vendor is interesting. The watermelons look good to me too! I also like all those flags.